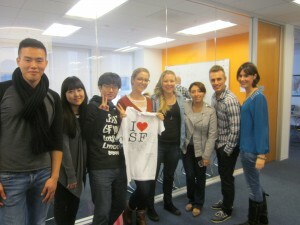 Yes, EC San Francisco students Love SF. And they invite you to join our school as well. And this is a good time to sign up for classes in 2014 because you can get reduced prices for English Courses. *Learn about the unique city of San Francisco by visiting many of the great neighborhoods with your teachers, everywhere from North Beach to The Haight. *Live in our brand new student residence, The Monastery, in San Francisco’s hippest neighborhood (The Mission) where you might see one our neighbors, Mark Zuckerburg, out having coffee!